The test printing of the Ono no Komachi print was much more difficult for me than Tenji Tenno had been. There were double the number of colours needed, and the kimono patterns were much more complicated. I hadn't had much trouble choosing shades for the first print, as the original was quite clear and I simply copied it, but this page of the book was very faded, and it took me many attempts to find pleasing colours. I had particular trouble with pink. Using what I thought was common sense, I simply mixed a red pigment with some 'gofun', a white powder pigment made from ground shells. This made a pink all right, but not only did it turn out looking like candy floss, but the resulting whitish paste completely covered up the black sumi lines on the print. Something was obviously wrong. I had read in various places that the black outlines on Ukiyo-e prints were always printed first and the colours applied later, but if this was the case, then what could I do to stop the colour from covering the lines? Easy! Just dial my 'Hanga Emergency Number' - Matsuzaki-san! How about the P/R side of things? I had sent off a small flyer to various media outlets, but what came of it? At first, nothing. A couple of weeks went by with no responses, and I started to get the feeling that this work was perhaps just not going to be of interest to anybody but me ... I got a shock though, one day a couple of weeks later. I was leafing through the Japan Times newspaper while eating breakfast, and nearly choked on my granola ... there was my picture staring up at me, along with a description of my project! Rather than call me for information on what I was doing, they had simply run my information as a kind of 'press release'. The next couple of weeks saw more action. Another English language daily, a small local newspaper, the Tama edition of the Yomiuri Shimbun, and a national magazine all called for information and came round for interviews and pictures. All this activity was a great encouragement to me. So other people thought this was interesting too! Surely then, making a living was just going to be a simple matter of letting enough people know what I was doing. Somewhere in the 125,000,000 people inhabiting these islands, there must be a few dozen who would be interested in collecting my prints... Well, I didn't get 125,000,000 phone calls from all over Japan, but I did get one - from about 50 meters away! Mr. and Mrs. Cho, the owners of the local bakery where we shopped for our bread expressed surprise, "We didn't know you were a printmaker! Sign us up!" I delivered the first two prints in the series to them, and somewhat hesitantly accepted their payment. It wasn't a particularly auspicious start to our visit. We had been met at the station, but now neither ardent coaxing nor muffled imprecations would get the car to start, and we were deposited in a nearby coffee shop to watch the rain beat against the windows while the JAF man was called to come and do his magic tricks. The performance was thankfully short, and we were soon back on track, heading towards the restored country farmhouse that serves English woodblock printmaker David Stones and his wife Akiko as residence, workshop and gallery. They have lived there, in the 'backwoods' of Okazaki City in Aichi Prefecture, for just over 11 years now, having spent an entire year rebuilding the place from 'below the ground' up. 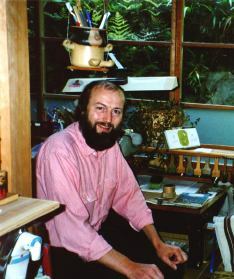 For another ten years before that they made their home in Nagoya, an environment David had not found conducive to printmaking. Later in the evening, as we are perusing the prints hanging in the gallery room, he will indicate a print series showing a forest in various seasons. "Could you see me designing this while living in a concrete 'mansion'?" Indeed, although he has lived in Japan for 21 years, it is only since coming to this rural valley that his artistic abilities have flowered. His prints are nothing like mine. Although born of carefully aged cherrywood blocks and fine Japanese paper, the same materials as traditional Ukiyo-e 'hanga', this work owes nothing to the old themes of actors and courtesans. 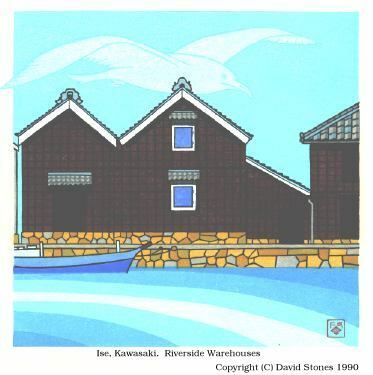 David prints what he sees around him - fish swimming in a pool a few steps from his home, a wooden bridge at a shrine, a Japanese garden, a riverside scene. Over the years here in the Okazaki countryside, his portfolio of prints has grown fat. Not for him is the bold, bright, wall-filling graphic. Most of his designs are small, the scale intimate, the inspiration close at hand. There are few human figures, and the mood is invariably one of serenity. The subject and the medium are in harmony, just as are the artist and his environment. Nature itself is a dominant theme in his work, indeed a dominant theme in his life. As we stroll through the fields near his home, he proudly points to trees at various stages of growth. "We planted that one ... and those over there ..." It is not just a matter of 'paying back' to the earth what he has taken away with his printmaking. For him, being custodian of a piece of land means taking the responsibility of making sure that it will be passed on to future generations in better order than he found it. His brand of forestry, unlike the ruthlessly commercial current Japanese practices, is concerned simply with encouraging a better habitat, and local farmers shake their heads when coming across his latest plantings. Concern for the future is also reflected in David's studio activities. The Kyoto printmaker who assisted him in the early days is now in his 80's. No one is waiting to fill his shoes, a familiar situation these days in many traditional Japanese crafts, as the young generation flocks to jobs offering somewhat more money and excitement. David sees his role as a kind of bridge, a link between the disappearing generation of old craftsmen and a yet-to-appear generation of young people eager to learn traditional arts. If it is to be the foreign printmaker's job to preserve the traditions, then so be it. Preserve them he will. And as he is doing so, he will inject fresh blood of his own, giving additional impetus to survive for yet another generation or so. So we leave them working away, David sitting at one of the benches in his studio, the tap of his hammer filling their beautiful home with the sound of a new print being created, Akiko in the next room preparing for one of the tea ceremony classes she teaches, and one of their young trees standing outside rustling its leaves against the windows .... Who says there's no such place as heaven? 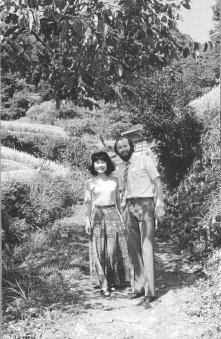 David and Akiko welcome visitors to see the prints, but please phone first to confirm your visit, as they are often out on sketching trips. They are accessible from the Chuo expressway (Okazaki Interchange), or by train (Miai Station on the Meitetsu main line between Nagoya and Toyohashi). He can pick you up (in their new car!). During the six or so years that I have been living here in Japan, I have visited many shokunin, and have enjoyed long discussions with them about their life and work. I have been surprised by many things they have said, and have come to realize that their thinking is sometimes quite different from my conceptions of a craftsman's ideas. This was driven home to me quite forcefully when I was talking a while ago with Mr. Isamu Adachi, proprietor of the Adachi Hanga Institute, a well-known print publishing house here in Tokyo, and a place we will be visiting in a future issue of this newsletter. Mr. Adachi is widely known as one of the world's leading authorities on traditional Japanese printmaking, and the prints produced by the craftsmen in his workshop are recognized as being of the highest standards. When I showed him some of my prints and asked for his comments, I did not expect (and did not receive) high praise for my efforts. What he did say though, confused me quite a bit. He used the expression 'teinei sugiru' - 'too careful', in reference to my prints. When I took it as a compliment and replied with 'Thank you, thank you,' he just shook his head in disgust at my lack of understanding. Since that day I have given considerable thought to his words, and to what he was trying to tell me. Let me tell you about a Westerner's idea of a 'craftsman'. The following images immediately come to mind: an experienced, skilled worker ... someone methodical, who slowly and carefully crafts his products ... patient ... willing to take as much time as necessary to produce quality work ... carefully, carefully! I can imagine English readers of this newsletter nodding their heads in general agreement. 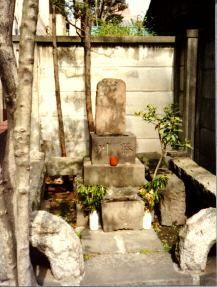 But when we stop our Japanese 'man on the street' and ask him about his concept of a 'shokunin', what do we get? 'An experienced, skilled worker ... someone with a deep knowledge of his tools ... able to work with incredible speed ... to turn out quality work ...' Now it is my Japanese readers who are nodding. If I as a Westerner hear a story about say, a guitar maker in Spain who takes a year to carefully build each instrument, I am lost in admiration. To a Japanese shokunin, this is inconceivable, and to him it is a horrible insult to be thought of as a slow worker. As someone who was raised in Western thinking, and who is now trying to work as a craftsman in Japan, the situation for me is thus somewhat schizophrenic. But I am starting to understand. What Mr. Adachi was saying to me was that my prints were 'dead', lifeless. Yes, they were neat, clean ... 'nice'. But my knife had moved too carefully, my baren too delicately. I had not worked with my 'feelings', my heart, but with my 'intellect'. The difference is perhaps easier to understand if one thinks of calligraphy, both Western and Japanese. Picture this: a kimono-clad Japanese lady kneeling before a blank sheet of paper, brush poised in her hand. She starts the first character. Her hand moves slowly, carefully. She watches closely to see that the brush follows the planned 'path'. Across. Down. A little dot here. A little stroke there. Bit by bit, slowly and steadily, until it is done. Ridiculous? Of course. How does it really go...? The poised brush ... and then a quick slash, a lunge, the brush sweeping across the paper as if it had a will of its own. More strength here. Pull back there. The very antithesis of careful planning! The result? Living calligraphy. Words dancing down the page. And traditional Western calligraphy? Well, just by looking at it (see picture), you can tell how it was made. It doesn't dance anywhere. It marches! The question is not really one of simply speed, but rather one of 'intellectual involvement'. We Westerners obviously like to work with our 'brain', analyzing, calculating, and controlling every step of the process. The Japanese perhaps like to bypass this organ, and allow the body and muscles (well-trained) to do the work more 'naturally'. The same thing is apparent in the way we learn things. I want to inspect, study and analyze the process. I want to 'figure it out'. The Japanese seem to learn by osmosis, by rubbing shoulders with a skilled practitioner. I am reminded of the Japanese shakuhachi teacher who stopped accepting any more Western students. "They ask too many questions," he cried! None of this is to imply that the Japanese way is good, and the Western way is bad. They are just different, very very different. They exist in their separate worlds. Except for my case, where they are trying to live in the same head, and the same hands! I have learned most of what I know about printmaking by working alone and trying to 'figure it out'. Of course I have had occasional help from people in the field, but my approach has been by and large 'analytical'. I am now beginning to realize that I will probably not be able to improve much further this way. My carving is now 'correct', the lines all in the right places, the right thickness. My printing is just as 'correct', smooth colours, neatly fitted within those lines. This is not enough. Perhaps my collectors are happy with what they see, but Mr. Adachi sees more. Or perhaps it is more correct to say he doesn't see ... and what he doesn't see is 'life', motion. He doesn't see my carved lines dancing across the page. The solution is obvious. Time. Time spent with experienced craftsmen shokunin. Listening to the sounds of their work. Breathing the same air as they, and drinking the same 'sake'. Simply sitting in the same room. And not asking questions! And if I can do more of this, then perhaps one day sometime in the future, Mr. Adachi will look over one of my prints, and then say to me, "Maaa, not so bad ... not so bad ...." Will I live so long? So, there's another year finished. It's been another good 12 months of work, and perhaps even a bit of improvement. It's a relief to be still right on schedule, especially considering our chaotic lifestyle around here. Somebody once wrote one of those 'funny' laws to the effect that 'Work expands to fill the time available', but I'm finding that it's also 'compressible'! Even when you just don't have the time ... somehow it all seems to get done anyway. A year ago in the Winter issue I included a photograph of myself with the finished prints all stretched out beside me. I can't do that this year ... it doesn't fit! It feels good to be 40% finished. Just a few more days (365) and I'll be halfway! Forty down - sixty to go!